A walkway passing right behind the apartment (Put u bregi) leads down into the center of Opatija. 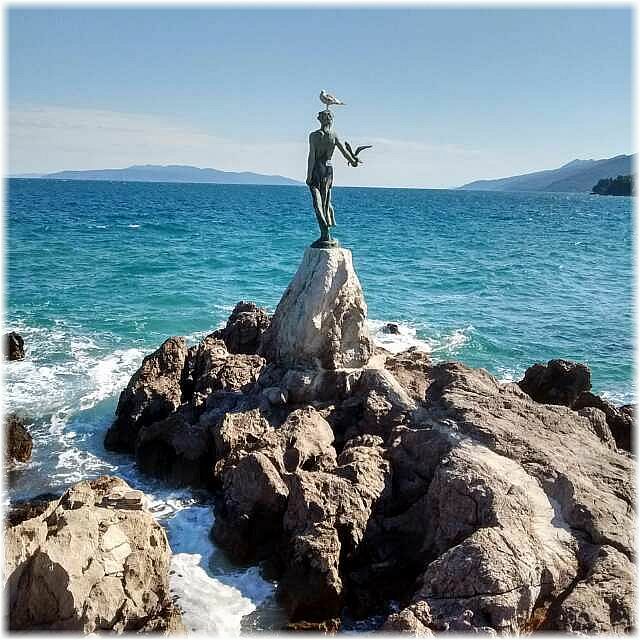 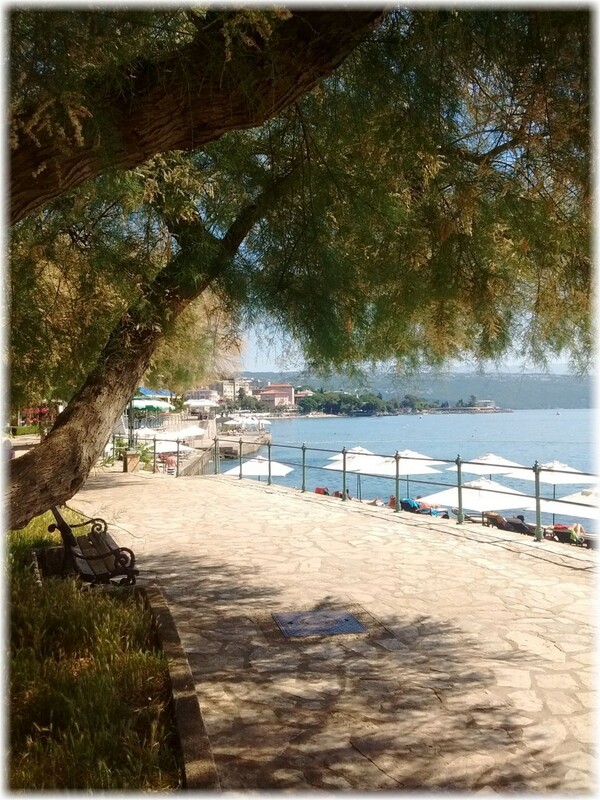 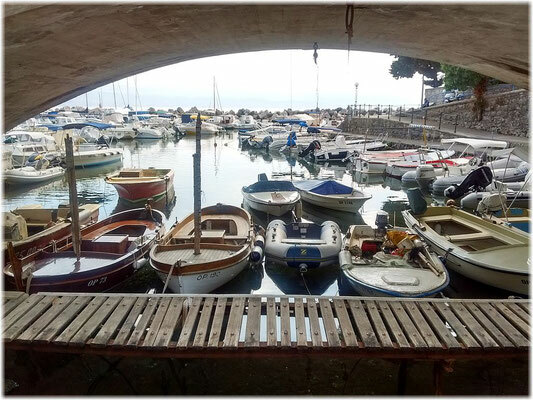 When strolling along this walkway right by a number of beautifully restored villas you will quickly discover why Opatija is still known as the "Pearl of the Adriatic Sea". The town of Opatija was first mentioned in the 15th century in records of the Benedictine monastery Sveti Jakov. 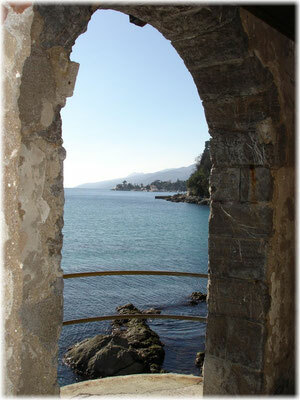 (A small church belonging to the original monastery has survived to this day.) 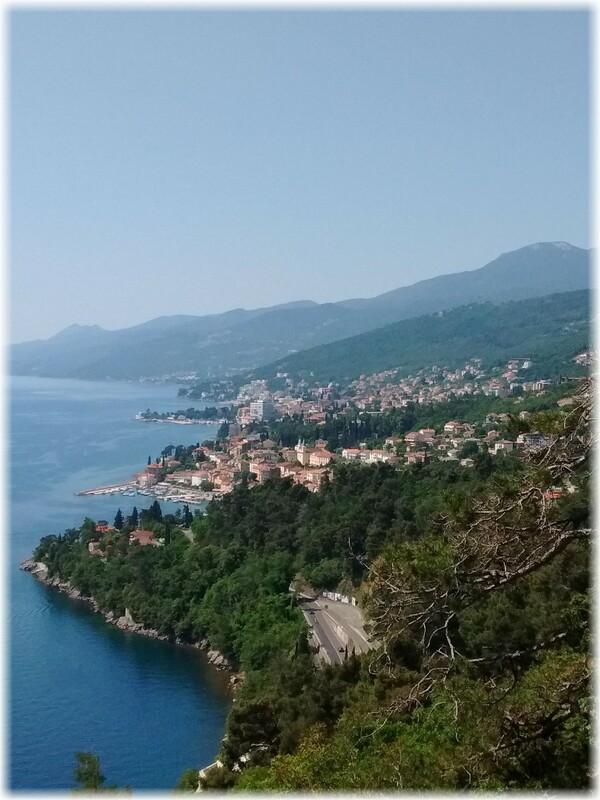 The town started to gain significance when the coastal road between Rijeka and Lovran was completed in 1838. 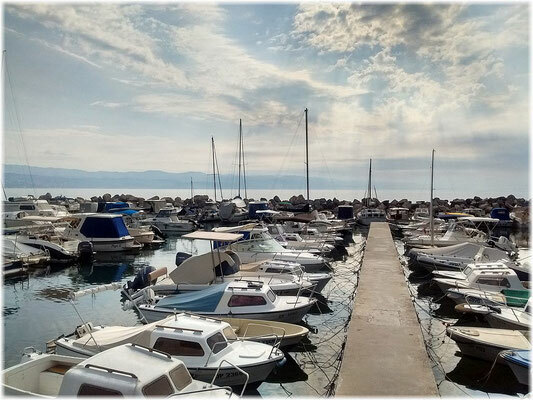 In 1845, a wealthy merchant from Rijeka chose Opatija as the site for his new weekend home. 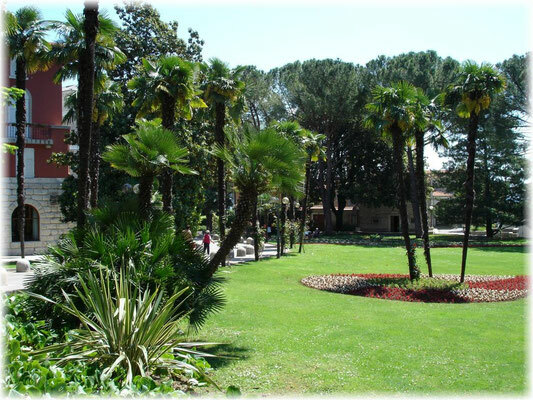 He named it Villa Angiolina in memory of his late wife. 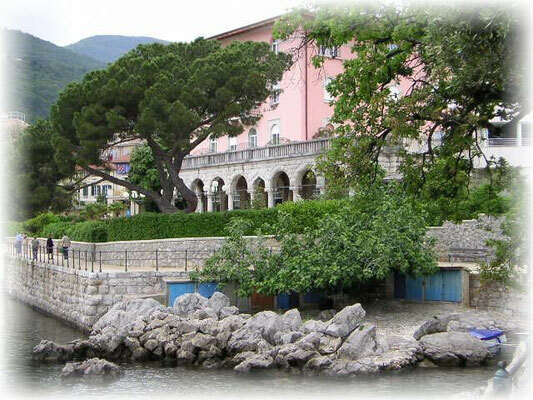 When constructions were completed, Villa Angiolina was the most elegant estate around. 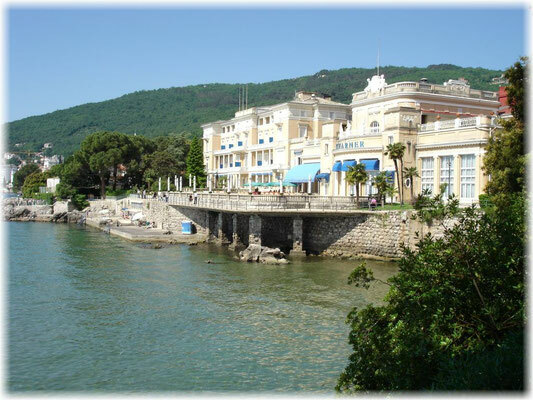 Instantly, Opatija and its Villa Angiolina received the attention of the prominent figures of Istria. With the extension of the Vienna-Trieste railroad all the way to Kvarner Bay, Opatija continued to gain status and significance. When Europe's nobility and upper classes started discovering the beauty and mild winters of Istria, Opatija turned into an exclusive wellness destination. Many of the new wealthy visitors had lavish vacation homes built close to the coast, many of which you can still see today. Among the many things that these new residents introduced to the area where plant species from their home countries. 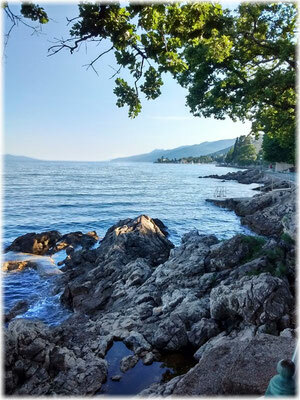 Up to this day you will find exotic plants from around the world in Opatija’s magnificent parks and gardens that were established in the 19th century. Beginning in the 1880s, a large number of Grand Hotels, inns, villas, vacation homes, spas, promenades, and parks were built. 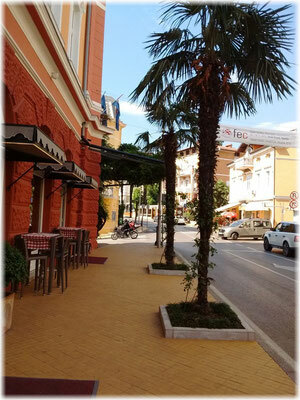 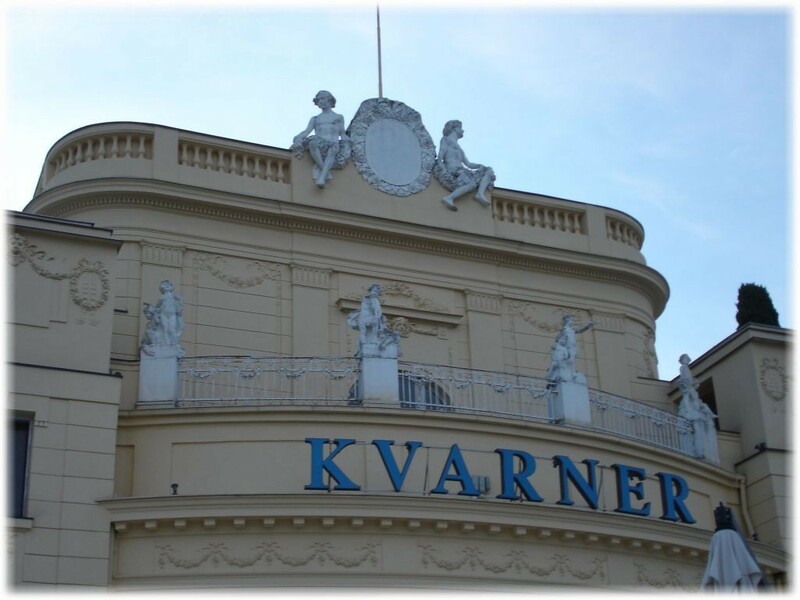 The first hotels that popped up were famous Hotel Kvarner (1884) and the still existing Hotel Imperial (1885). 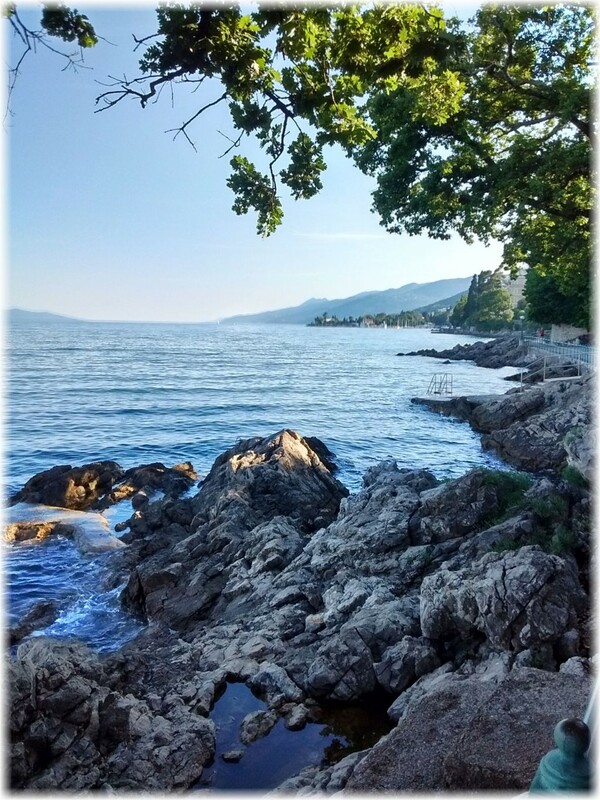 A royal decree from 1889 made Opatija the first therapeutic marine spa resort on the Austrian Adriatic coast. 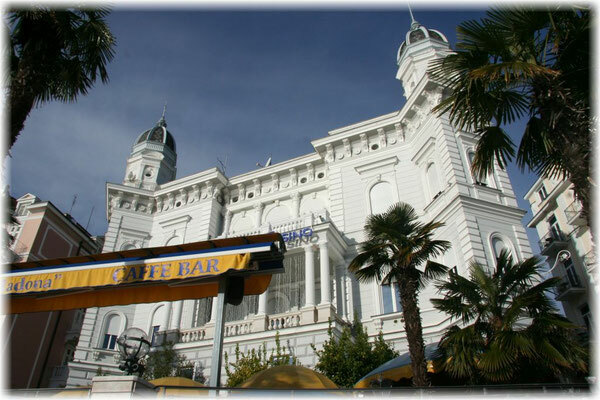 On March 29, 1894 Opatija was the venue for a meeting between the Austrian King Franz Josef I. and German King Wilhelm II. 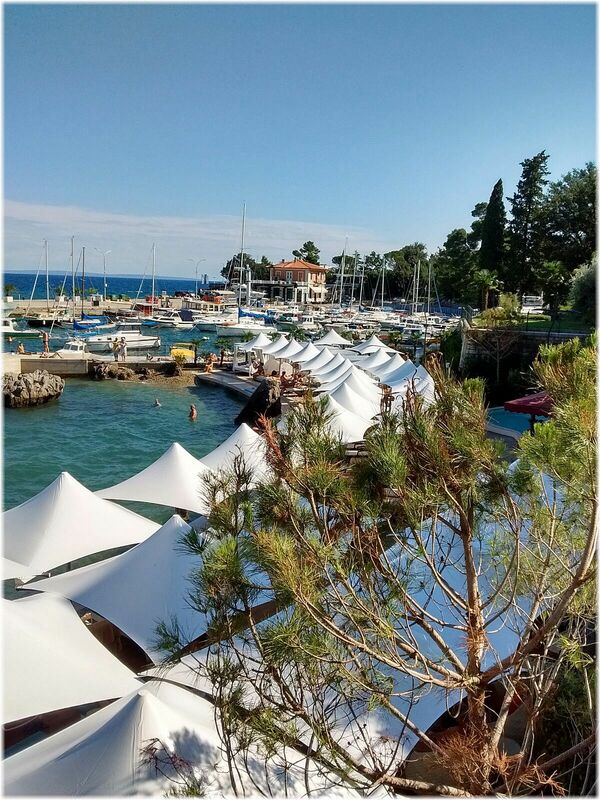 Other noble guests included Austrian Queen Elisabeth (Sissi), German Queen Auguste Viktoria, Romanian King Carol I. and his Queen, and many more. 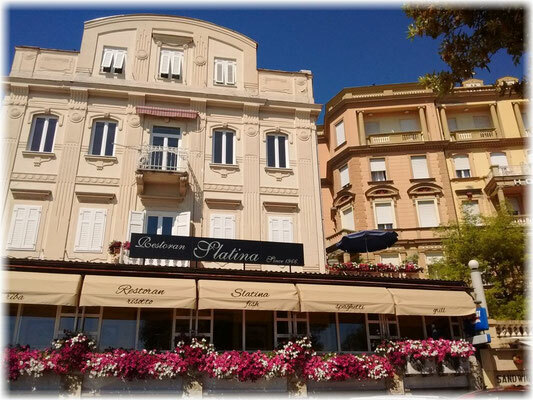 Alas, Opatija did not remain unaffected by the political events of the early 20th century. The end of the Danube Monarchy also marked the beginning of Opatija’s decline. 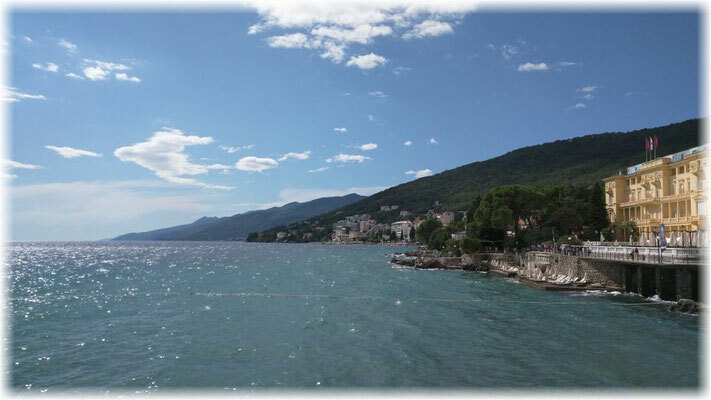 After World War I, Istria became part of Italy, and after World War II, it became part of communist Yugoslavia. In the course of these political transitions Opatija lost much of its glamor. 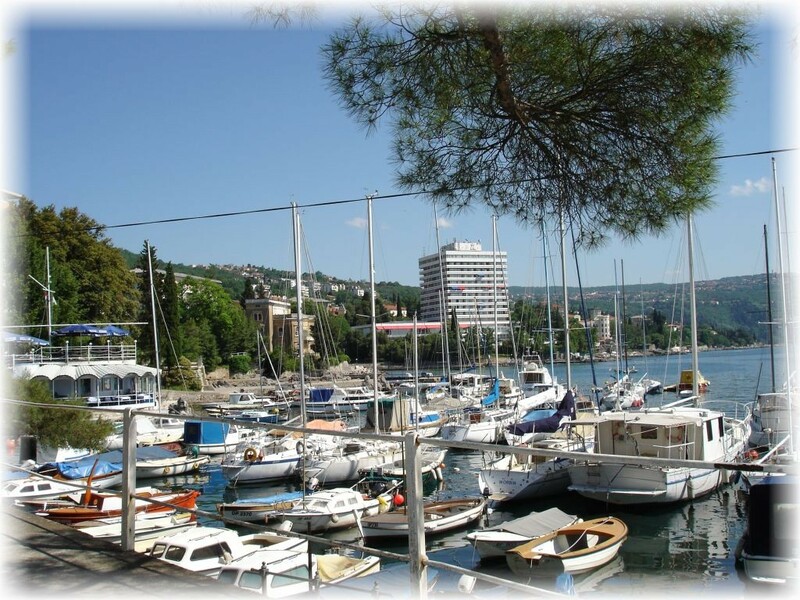 But beginning in the 1970s and 1980s and especially after the Balkan Wars ended, it regained its beauty and charm. 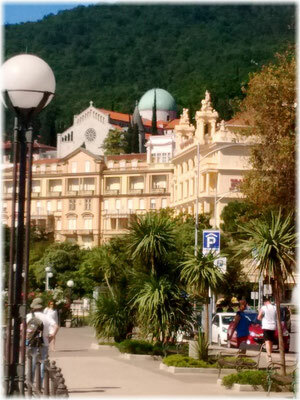 Now the town is once again one of the most popular vacation destinations in Europe, drawing people from around the world!